Show your concrete a little love with a thorough cleaning from Renew Crew of Topeka. Driveways, walkways, porches, and patios all experience regular wear and tear, but that doesn’t mean they have to look dirty and dingy. With our concrete cleaning and protecting services, you can restore the look of your concrete surfaces and boost your home’s exterior as a whole. You deserve the best – we’ll make sure you get it. Do-it-yourself concrete cleaning may seem like an affordable alternative to professional power washing, but it may do more harm than good. 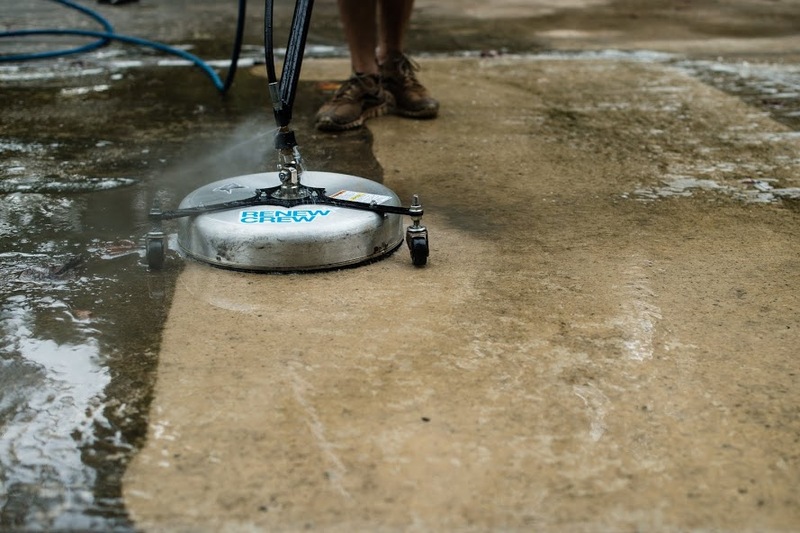 Without the proper tools and training, you could chip, crack, or break your concrete entirely just by not using the pressure washer correctly. You could also put stroke marks on the concrete from not dispersing the pressure evenly. The result is an unsightly mess that’s best to avoid at all costs. The founders of Renew Crew spent years developing an eco-friendly formula for loosening up dirt and oil embedded into wood or concrete. We use this foam as the first step to prepare the surface for effective power washing. Once the foam has had time to soak in, we use controlled pressure to blast away the dirt while preserving the integrity of your concrete. All of this is done without hurting your plants or other surfaces on the property. We don’t just stop at cleaning though. We finish our 3-step cleaning process with a layer of polymer sealant that protects your concrete from moisture and harmful UV rays. This will naturally restore the shine on your concrete and keep it looking better, longer. It doesn’t matter if you have a small driveway or a multi-level car garage that needs to be cleaned. The experts at Renew Crew of Topeka have the tools and expertise to clean your concrete for you. Contact 785-887-6100 for a free quote for concrete cleaning and sealing, and we’ll send someone out to talk to you in person. We’ll provide a detailed estimate that explains exactly what you get for the investment. Be sure to ask about our other pressure washing services in Topeka, including deck cleaning, log home cleaning, hardscape cleaning, and more. We look forward to making you part of our growing family!